Well folks, we have returned to Parbat. Our most recent delivery of tin was for 25 families in the village of Gijyan, where our dental technician Anita made multiple visits to help coordinate. 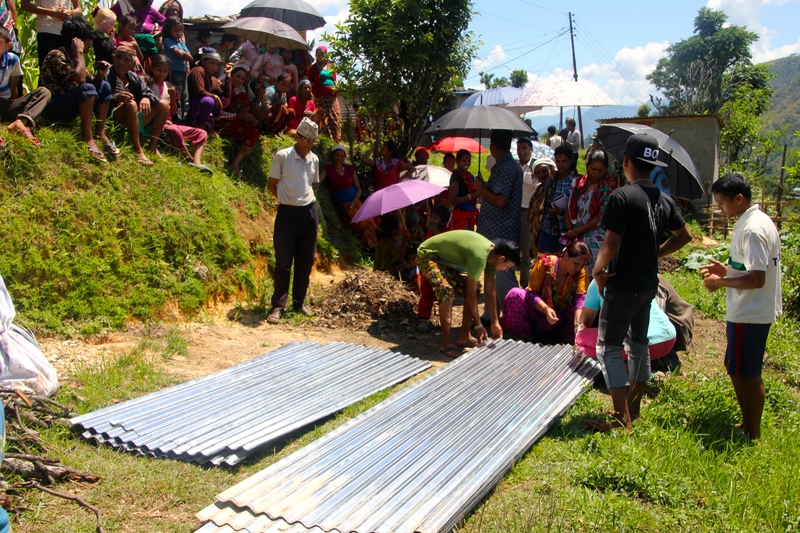 We’ve learned a lot since our first visit to Parbat a few short weeks ago; now, we require that people begin building a frame before we provide the tin roof. I present you this awkward photo of me, to prove that at least Dilmaya and Anita were laughing at my jokes. This day went really nicely. There was a welcome ceremony with flowers and tikka and everything – a process which all of us prefer to skip, but which must be allowed for if the community is really looking for a chance to express thanks – and I was asked to give a speech. I’m not much for public speaking in English, but every once and a while I find myself in some Nepal speech situation where aliens take over my brain and make me suddenly completely fluent in another language, and I have everyone’s rapt attention for four solid minutes. I cracked jokes, I said how much we appreciated how hard they’d all worked to rebuild, that we know roofs don’t do much without the effort of the people who need to live under them, but that we hope our small contribution to their efforts will go a long way to extend their results. I offered that the reason I was taking photos and recording was to share their village and their story with other people in the world, not to show off photos of my disaster vacation, so I hoped they wouldn’t mind. Anyway, as you can see, this speech was more riveting in Nepali than English. The strange thing is if you asked me to write it down in Nepali now, I’d need lots of help. Sometimes these things just come out of my mouth and I don’t know where they come from! After that we began our tin delivery and it was hot as all get out. This one lady kept following me around trying to keep an umbrella over my head for some shade, much like an 18th century European Dutchess, which I truly appreciated because it was hot, I tell you, HOT. We visited a handful of the houses that were being made or had been completed in anticipation of our tin delivery. Some of them had wonderful bamboo work. 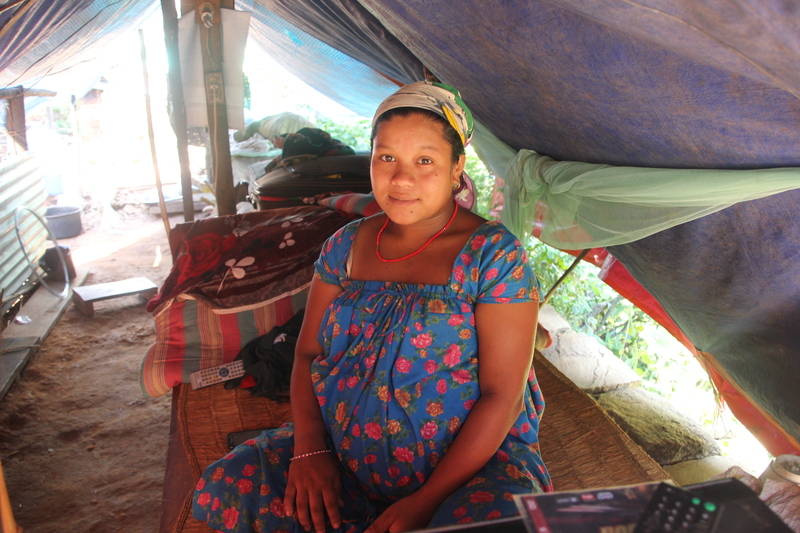 I spent some time talking with this 21 year old woman who is going to deliver her baby any day and was living under this tarp, where her family had hooked up electricity and a TV. 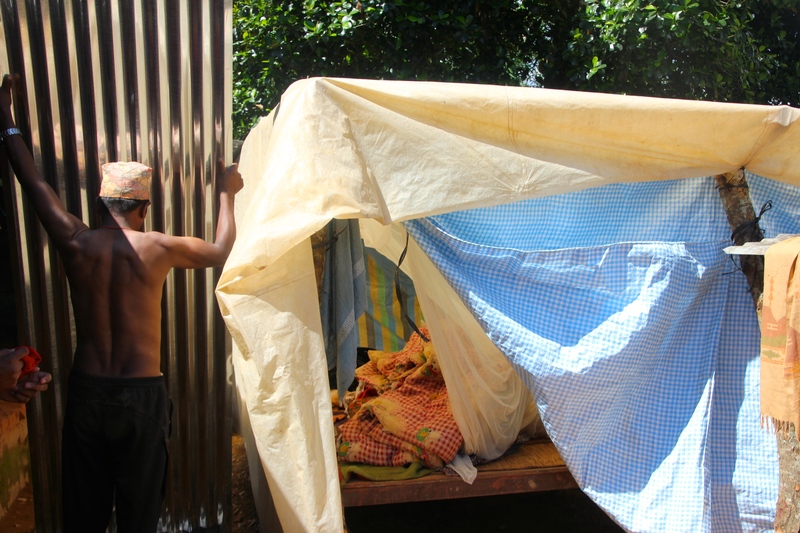 I hope that with the tin roof, her family will replace this heat-insulating tarp with ventilated walls made from something natural. Dilmaya and Anita and I all felt really great about today. Our 25 bundles of tin went on 25 respectable shelters. Success!